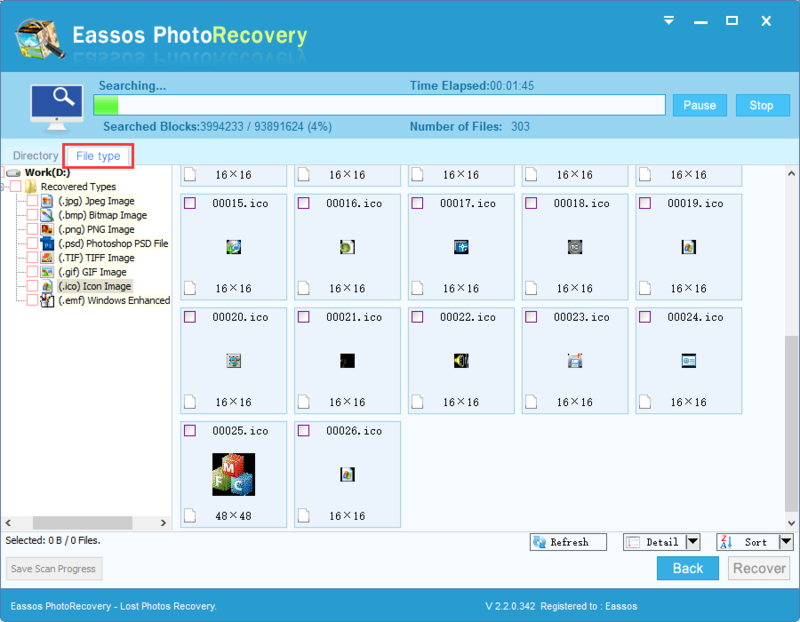 Eassos Photo Recovery is able to restore file by analyzing the way it stores data after scanning continuous area of hard drive or partition. 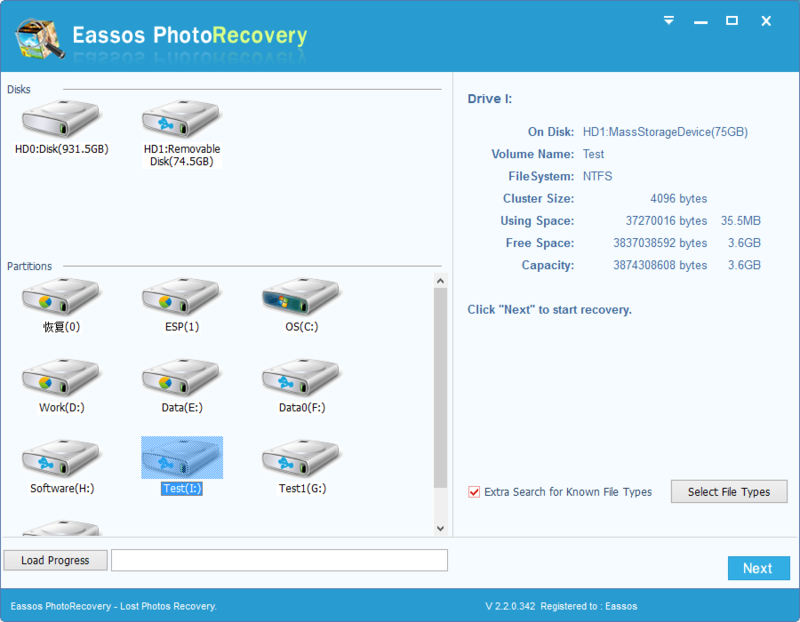 This recovery solution is usually used when file system is damaged so severe that photo recovery software fails to reorganize file directory structure and rescue data. For instance, JPG file format always stores data starting with hex data "FFD8FFE0", which is usually followed by information like image width and height. Therefore, when Eassos Photo Recovery finds "FFD8FFE0", it'll recognize it together with followed information as a JPG file. Once the starting info of a file is identified, the photo recovery software keeps analyzing file structure and make out file size by way of special algorithm until the entire file is recovered. You can click title panel to sort file types so that you can quickly find desired file types. When you select all needed file types, you can click "OK" button. You can view files recovered by file types under the directory "Recovered Types" on the left part after file scanning is done. Files found in this way will be sorted by file type and put in one folder named by file extension. In the situation that file number of same type exceeds 1000, they will be put in more than one folders. It's necessary to note that, files recovered by type lose original names. This is because file name information is saved in file system, but file recovery by type doesn't analyze file system which is often badly damages. Therefore, all files are named by numbers automatically. 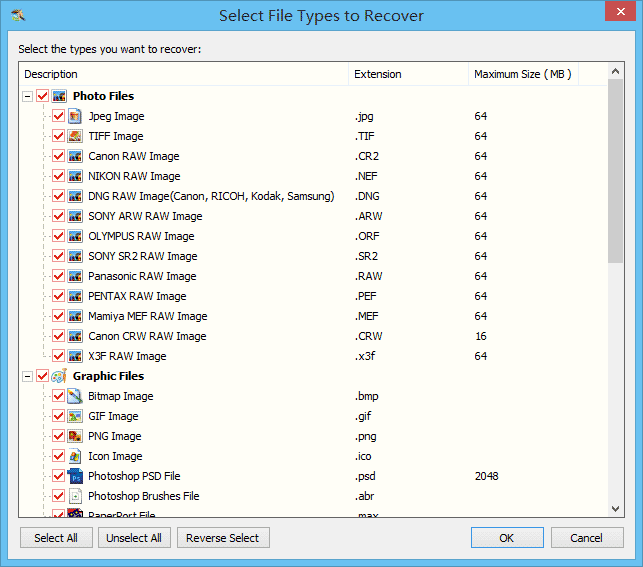 You can check whether recovered files are correct by file preview function. Then select desired files and save them.